Our newsletter on “Managing Your Boss” has been one of the most popular with our readers, more than a few of whom have written to ask “What if my boss is unmanageable?” For those situations, our partner Tom Gosselin claims, you may need to sharpen your negotiating skills. Tom is the author of Practical Negotiating, a superb book on the art and science of negotiation, and here he shares a few ideas to apply in the workplace. Picture yourself working on a Friday afternoon with a full plate. You just can’t handle another project, when your boss e-mails, “I know you’re loaded down, but I need a report put together for Monday. I wish I could give you more time, but my boss Pat is really hot on this.” What do you do? You probably express anger or frustration to yourself, but then you work most of the weekend, missing time with your family and friends. You get the report done (and well! ), but at what cost? As the person taking on the task, it’s up to you to determine the length of the sides of this triangle. Once you’ve estimated the task, you can then apply the Rule of the Triangle, which states that the triangle’s area must remain constant. That means that any change to one side requires an adjustment to one or both of the other sides. Let’s imagine that your boss assigns you a project, and you estimate it will take you ten days to complete, with two assistants. But your boss needs it done in five days. In other words, your boss insists on cutting the Time leg of the triangle in half. 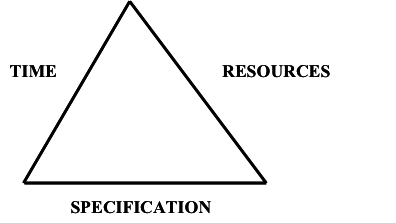 The only way you can meet her deadline and retain the area of the triangle is to adjust one or both of the other legs: Resources or Specification. So, you have two options: you can add staff, or you can offer partial delivery (i.e., get your boss to change the specifications). Remember: an adjustment to one side requires additional adjustment to at least one of the others. 1. Allow Reasonable Time for a Quality Job. Become a tough and realistic estimator. Restrain your optimism. Make accurate estimates of what it takes to do a job, and then don’t commit yourself beyond your (or the team’s) capabilities. 2. 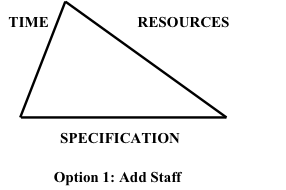 Determine the Specifications. Take time to determine what the requestor wants, as it may not be immediately obvious. Ask questions such as “What are your objectives for this project?” Save yourself wasted work by gaining clarity on what the end product should look like. 3. Build in a Contingency Reserve. Give yourself room to adapt to changing conditions: someone being pulled off suddenly, or the task taking longer than you expected. Most people fail to build in any slack and therefore are forced to renegotiate. If you include a contingency in your plan, you will save a great deal of frustration, and may even be able to deliver early or under budget. 4. Use Resources Creatively. Your company’s priorities change daily: projects get dropped, added, re-prioritized, or accelerated. If change occurs, you must revise the estimate and ask for more time or resources. Provide options to your boss, such as changing the schedule or getting some outside temporary help. Use the Triangle to think the situation through and explain it to your boss. 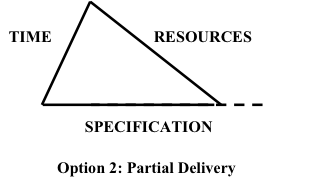 Specification-Fixed Tasks cannot be changed, but time and resources can be adjusted. Time-Fixed Tasks are deadline driven; there may be an unmovable event driving this task, so you need to add resources or change the spec. Resource-Fixed Tasks are keyed to the availability of money, staff or other resources—so see if the scope or deadline can be adjusted. 6. Learn to say “Yes, AND” rather Than “No.” Instead of saying “No,” try “Yes, and here’s what the cost or impact will be….” In other words, test the deadline or budget constraints. How strong are they? How much give is there? You may be surprised if you actually ask. Adapt these six practical steps to your situation. If your boss insists that all projects be done as scheduled, ask for more resources. If neither time nor resources can be adjusted, you may need to ask your boss to reassign one or more of the projects that you’ve already been given to someone else. If you use the Rule of the Triangle and negotiate effectively, everybody wins and nobody loses. The alternative? You can say nothing, grit your teeth, and work all weekend.